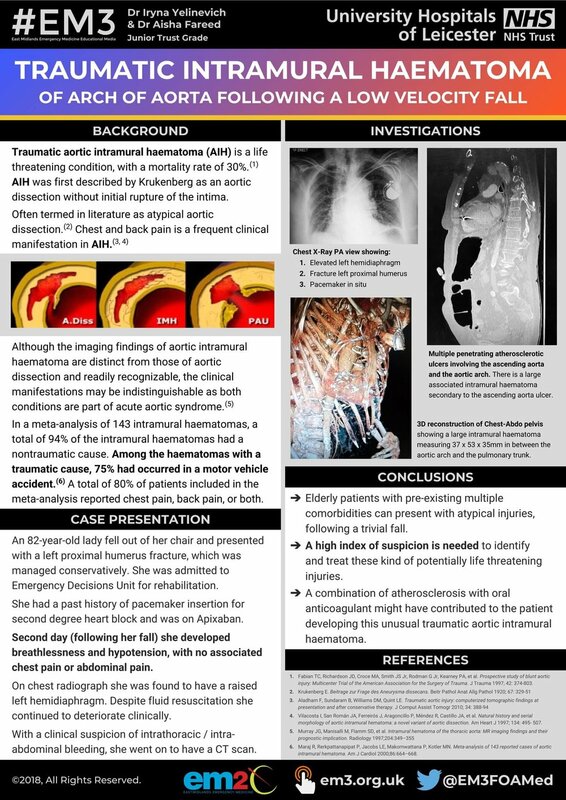 Traumatic aortic intramural haematoma (AIH) is a life threatening condition, with a mortality rate of 30% . AIH was first described by Krukenberg as an aortic dissection without initial rupture of the intima. Often termed in literature as atypical aortic dissection . Chest and back pain is a frequent clinical manifestation in AIH [3,4]. Although the imaging findings of aortic intramural haematoma are distinct from those of aortic dissection and readily recognizable, the clinical manifestations may be indistinguishable as both conditions are part of acute aortic syndrome . In a meta-analysis of 143 intramural haematomas, a total of 94% of the intramural haematomas had a nontraumatic cause. Among the haematomas with a traumatic cause, 75% had occurred in a motor vehicle accident . A total of 80% of patients included in the meta-analysis reported chest pain, back pain, or both. An 82-year-old lady fell out of her chair and presented with a left proximal humerus fracture, which was managed conservatively. She was admitted to Emergency Decisions Unit for rehabilitation. She had a past history of pacemaker insertion for second degree heart block and was on Apixaban. Second day (following her fall) she developed breathlessness and hypotension, with no associated chest pain or abdominal pain. On chest radiograph she was found to have a raised left hemidiaphragm. Despite fluid resuscitation she continued to deteriorate clinically. With a clinical suspicion of intrathoracic/intra-abdominal bleeding, she went on to have a CT scan. Multiple penetrating atherosclerotic ulcers involving the ascending aorta and the aortic arch. There is a large associated intramural haematoma secondary to the ascending aorta ulcer. 3D reconstruction of Chest-Abdo pelvis showing a large intramural haematoma measuring 37 x 53 x 35mm in between the aortic arch and the pulmonary trunk. Elderly patients with pre-existing multiple comorbidities can present with atypical injuries, following a trivial fall. A high index of suspicion is needed to identify and treat these kind of potentially life-threatening injuries. A combination of atherosclerosis with oral anticoagulant might have contributed to the patient developing this unusual traumatic aortic intramural haematoma. Fabian TC, Richardson JD, Croce MA, Smith JS Jr, Rodman G Jr, Kearney PA, et al. Prospective study of blunt aortic injury: Multicenter Trial of the American Association for the Surgery of Trauma. J Trauma 1997; 42: 374-803. Vilacosta I, San Román JA, Ferreirós J, Aragoncillo P, Méndez R, Castillo JA, et al. Natural history and serial morphology of aortic intramural hematoma: a novel variant of aortic dissection. Am Heart J 1997; 134: 495- 507. Maraj R, Rerkpattanapipat P, Jacobs LE, Makornwattana P, Kotler MN. Meta-analysis of 143 reported cases of aortic intramural hematoma. Am J Cardiol 2000;86:664–668.